Qcheck is 4 + 4 small C++ scripts , using floats or integers , which try to emulate a real EPR-Bell experiment. For Windows, qCheck solution is located in the vs folder. There are 8 projects, 4 for integers and 4 for doubles. To generate the commands, open the solution in Visual Studio Express, accept the Visual version conversion warnings if any and generate the whole solution. New commands will go in the bin folder. Outside the dos folder separator and the dot bat name, all scripts behave exactly the same and use the same syntax, even the shell one. DOS accept a maximum of 9 arguments. If more is needed, try to change de default value in the script. For Linux, the scripts have been copied in /cpp. Go in console mode in the application folder and call the scripts bat.sh or else batdos.bat to produce results files in the data folder. There are small differences between the Windows and the Linux results, mainly because their variables types conversion implementation. This set uses float angles , rotations and hidden variables. 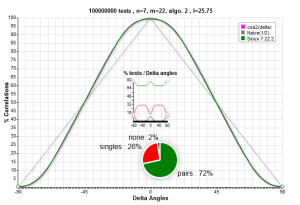 Results are averaged in integer angles and angles differences. There is no include file, the scripts are short and easy to check , edit, extend. The same files but this set uses integer angles , rotations and hidden variables. Check the unix owner of the files. Else check the Makefile to suit your environment. There is no need for a particular library. bat.sh will collect your arguments or use the default and call the 4 scripts to output files in the data folder. You can also run individual commands. All the default values may be overridden. You can also edit bat.sh to set your favorite parameters as default values.